← Co-production of knowledge…the next big thing? If you are an oceanographer or climate researcher, the sheer vastness of the Earth’s oceans is one of the biggest challenges. Aside from gathering a few samples aboard a research vessel – the snapshot approach – it’s inherently difficult to cover so much space in order to gather meaningful data over time. One technological solution might be ARVs, or “autonomous research vessels” that don’t move very fast but can cover a lot of ground – I mean, water. As Smithsonian magazine reported in May, an unmanned vessel called Wave Gliders recently completed a one-year, 10,000-mile voyage from San Francisco to Australia with no skipper aboard. 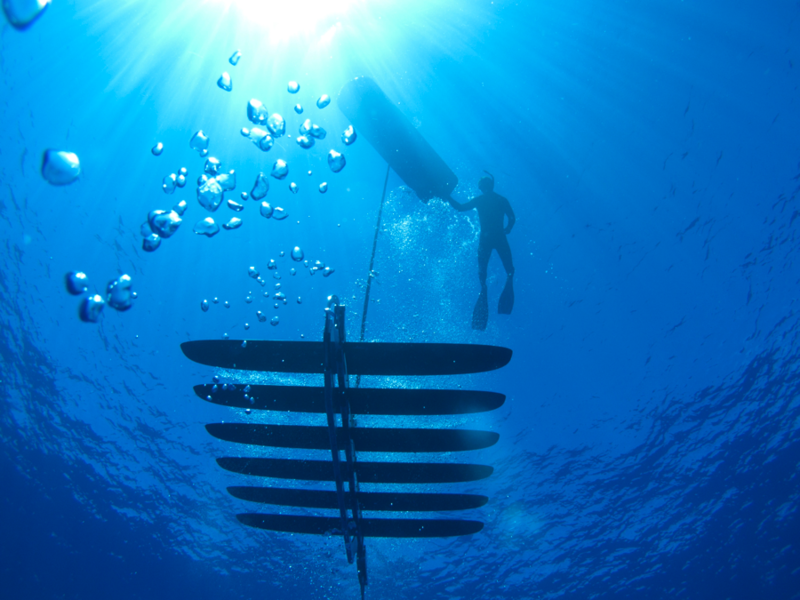 Liquid Robotics’ Wave Glider: Scuba diver not included. Wave Gliders, designed by a company called Liquid Robotics, use a float covered with solar panels to power an onboard computer and navigation aids. Attached below on a 20-foot cable are a series of paddles used to harness wave motion. Liquid Robotics said the unmanned glider can ride out hurricanes. The company recently christened Version 3 in its series of hybrid wave and solar-propelled ARVs. It touts Wave Gliders as ideal for collecting ocean data uninterrupted for as much as a year. The unmanned boats cost about $200,000 each, relatively cheap as research tools go. Unfortunately, the manufacturer also resorts to standard marketing fluff about providing an “end-to-end solution” for gathering ocean data. A better form of marketing is the PacX Challenge competition sponsored by Liquid Robotics and others (including energy giant BP!). Ocean researchers have submitted proposals for a $50,000 grant to use the unmanned ship for six months. One of the finalists was quoted by Smithsonian magazine as saying she wants to use the glider to track the growth patterns of photo plankton. Woods Hole Oceanographic Institute is among the judges who will select the competition winner from among five finalists. I ‘ve written a lot lately about the use of cheaper technologies like drones as potential gap fillers for Earth observation. By themselves, sensor-carrying robots won’t provide all the Earth observation data we need. But as autonomous systems like airplanes and boats become more sophisticated and reliable, they are emerging as affordable platforms for a range of weather and ocean sensors. The investment market seems to agree: In March, Liquid Robotics announced the close of a $45 million late-stage funding round. So, Anchors Away! Let’s see what if anything these new tools are good for and whether they can help advance climate science. The 900-pound elephant in the room is the growing liklihood that drones will be used in warfare (beyond the type of drone attacks by the U.S. in Pakistan and Afghanistan). Here’s one take on how the threat of drone warfare could reshape U.S.-China relations and the balance of power in East Asia and the Pacific. As we have noted, drone technology has plenty of applications in scientific and atmospheric research. These are clearly offset by the growing use of war drones.